The Lake Mackay Project is subject to a Joint Venture Agreement with Independence Group (ASX:IGO). IGO is earning a 70% interest in the tenements by solely funding $6 million of exploration expenditure. 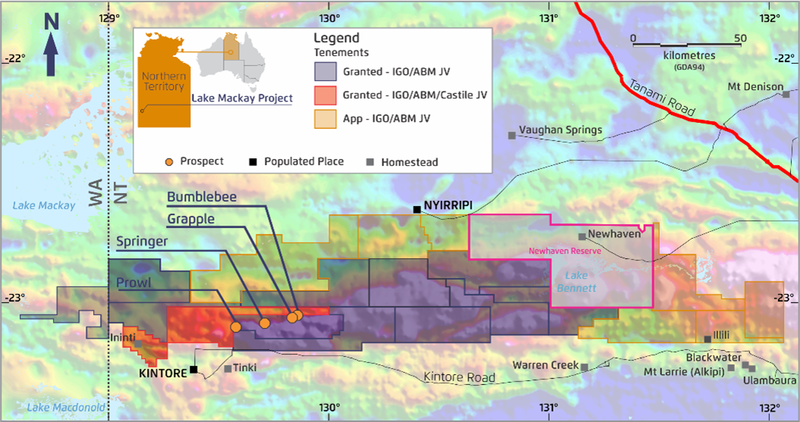 The Lake Mackay Project is located 400km northwest of Alice Springs, adjacent to the Western Australian border, and includes 12,833km2 of exploration licences and applications (11,933km2 IGO/Prodigy Gold JV, 900km2 IGO/Prodigy Gold/Castile JV). This emerging mineralised belt at Lake Mackay is at a very early stage of exploration. IGO is executing an exploration program as part of a joint venture with Prodigy Gold to systematically evaluate the Lake Mackay Project. The Project has a consolidated tenure over the favourable Proterozoic margin between the Aileron and Warumpi Provinces, and is characterised by a continent-scale geophysical gravity ridge and the Central Australian Suture. The JV partners consider that the exploration potential will unlock a new metallogenic province hosting multiple styles of precious and base metals mineralisation. Prodigy Gold acquired the Lake Mackay Project area from Tanami Gold NL in late 2009. The area, at the time of acquisition, consisted mainly of exploration license applications. Through negotiation with the traditional owners, via the Central Land Council, Prodigy Gold successfully entered into exploration access agreements and licenses were subsequently granted. Prodigy Gold has conducted initial scout drilling programs in the area and subsequently entered into a Joint Venture with IGO.